While there are various tools and add-ins that you can use for conducting Live polls during PowerPoint presentations, when it comes to Prezi, it can be hard to find a reliable one. While Prezis can be more attention grabbing than PowerPoint slides, you need to be able to effectively gauge user response at times and that isn’t easy with Prezis due to lack of third-party web services. Sli.do however, is an exception. 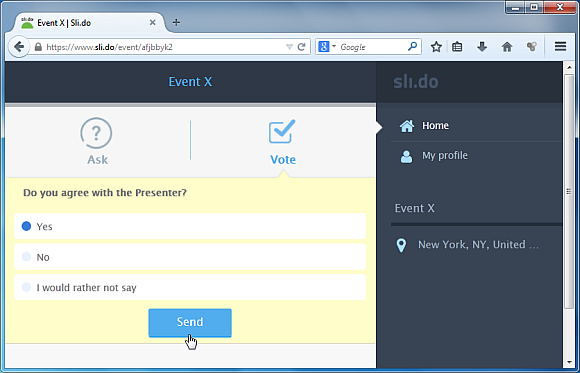 Sli.do is a service that allows conducting Live polls for Prezi presentations. What’s special about this web service for Prezi users is that it has an exclusive feature for conducting polls using Prezis and you can even present your Prezi presentations via your Sli.do account. 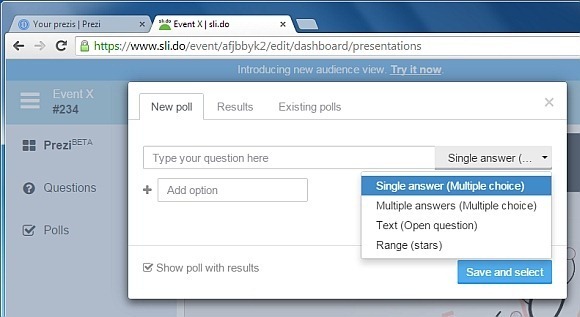 You can also create standalone polls and use direct links for conducting polls for PowerPoint or Keynote presentations. Step 1: You will require logging in with a Sli.do account and enable the Prezi options via ‘Settings’ before you can begin adding polls to your Prezis. 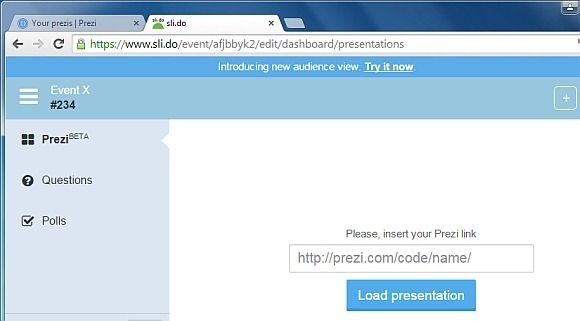 Step 2: Go to the ‘Prezi’ tab, enter your Prezi URL and click Load Presentation. 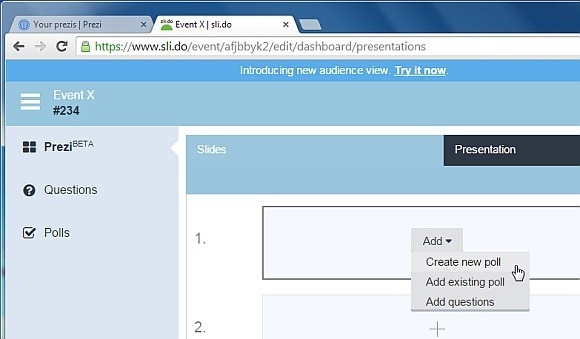 Step 3: You can now add polls to your Prezi via the Slides tab. You can either add a new poll or fetch an existing poll you created earlier. Your added poll will be revealed exactly at the point when you reach this slide, enabling you to conduct an instant poll for getting audience feedback. Step 4: While adding polls you can use multiple choice, rating based or open ended questions. 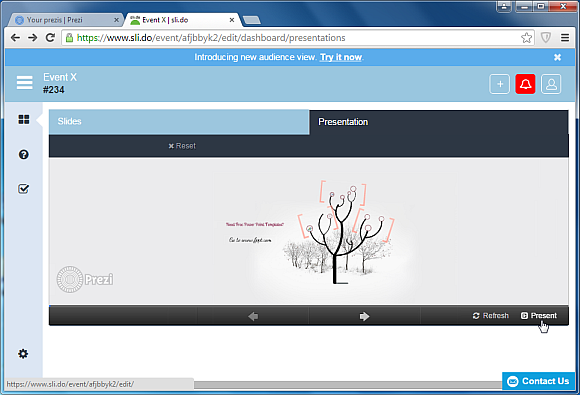 Step 5: Click present to preview your Prezi presentation and to determine if you are satisfied with the poll that will appear in your Prezi. Step 6: During a Live presentation when you reach the point when the poll is revealed, provide your users with the given direct link so they can go and poll using any internet connected device. 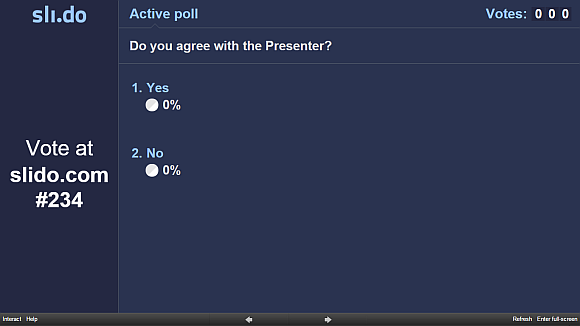 The below image shows how your polls will appear during your Prezi presentation. Providing the direct link will allow users to poll right from their smartphones, tablets or laptops by using an Internet browser. You can also provide the direct link beforehand so that users can use them for responding to your polls. The basic package of Sli.do is free, however, for more elaborate features you will require a paid package. You can use the Basic package to try out the Sli.do service and see if it’s a fit for your Prezis.